It's strike two for Danish design in Utah. Bjarke Ingels’ second proposed expansion of the Kimball Art Center in Park City, Utah did not fare any better than his first. The Park City News is reporting that the local City Hall rejected the firm’s updated design because it failed to meet the “municipal government's strict Old Town guidelines.” Or, to put it simply, it just didn't fit in. That's essentially what the Park City community said about BIG’s first design—a dramatic, twisting, log cabin-like structure. For the second go-round, BIG opted for a more refined approach with a concrete structure that lifts over the street and forms a 46-foot-high peak at the site's corner. In a statement, the Kimball Art Center’s executive director expressed the board’s disappointment with City Hall’s decision, and said that they are weighing their next steps. The center has a brief, ten-day window to appeal. Thanks in large part to public protest, Bjarke Ingels' plans for a twisted, log-cabin-like box for Park City's Kimball Art Center have been dramatically changed. Earlier this month Ingels' firm BIG unveiled a new design: a concrete wedge lifting 46 feet above the corner of Main and Heber Streets. "The building seems to rise with Main Street and the mountain landscape, while bowing down to match the scale of the existing Kimball," Ingels said in a statement. The former plan (pictured below), chosen in 2012, was 80-feet-tall. Its exposed wood facade paid homage to the area's early settlers and to the city's historic Coalition Mine Building. Besides echoing the local topography, Ingels told the Park City News that the new poured-in-place design "draws on the encounter between the modern functionalist architecture of the Kimball Garage (the museum's original home) and the regional vernacular style of the mountain architecture." Some locals had complained that the original design didn't mesh with the city's context, and that its height would impact property values. When asked how he felt about the Kimball's decision not to pursue his original design, Ingels replied: "The Kimball and BIG did the only thing possible, and now I think we have arrived at a design that can be just as striking a contribution to Part City's streetscape, if only a lot more intimate in scale than our first sketches." Despite winning the Kimball Art Center renovation commission in February of last year, Bjarke Ingels Group’s design proposal is far from beginning construction in Park City, Utah. After a seven-member jury of officials, architects, and a Park City resident chose the BIG museum revamp from a shortlist of designs from several prominent firms, the public made their dissatisfaction clear. The building is on hold and without community approval it will continue to sit in stasis for an indeterminable amount of time. 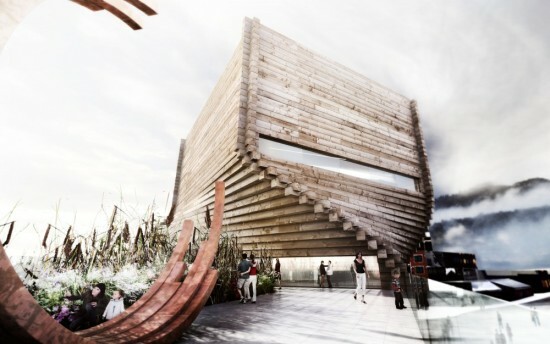 Rendered as a twisted timber box, BIG’s transformed Kimball Art Center is a “highly-evolved log cabin at an unprecedented scale.” Its wood construction alludes to the building materials used by miners, the area’s first settlers, and the proposed 80-foot height is congruent with an iconic heritage monument that once stood near the site. These architectural intentions do not appease nor appeal to Park City residents. Scott Iwasaki of “The Park Record” reported that some neighbors have complained BIG’s design does not fit with its historic locale while others are worried the tall structure will decrease surrounding property values. Concerns have been so severe that the art gallery’s Board of Directors chose not to submit the plan for a city review, the first step in building construction approval, even after the jury spent six months deliberating a design competition winner. The Board did make a pre-application to Park City’s Historic District Design Review, although this will have no effect on the status of the eventual renovation. Their next move, however, is uncertain. Repeating the competition process for a new design is an option, Kimball Art Center Chairman Matt Mullin said but its subsequent timeline extension would not be ideal. The renovation is meant to provide space to expand the Kimball’s art education classes and until the Park City community is content with the design, its present pause will endure. Bjarke Ingel's meteoric rise is perhaps the fastest of any architect since Eero Saarinen. His firm was just selected to design the renovation and expansion of the Kimball Art Center in Park City, Utah. Bjarke bested Will Bruder, Williams + Tsien, Brooks + Scarpa, and Sparano + Mooney. BIG's design calls for a torqued addition made of stacked railroad timbers. “BIG won the competition by proposing an iconic building that honors the spirit of Park City’s past and looks ahead into the 21st century," said juror Maurice Cox, in a statement. The phased project will begin in 2013 and be completed in 2015. 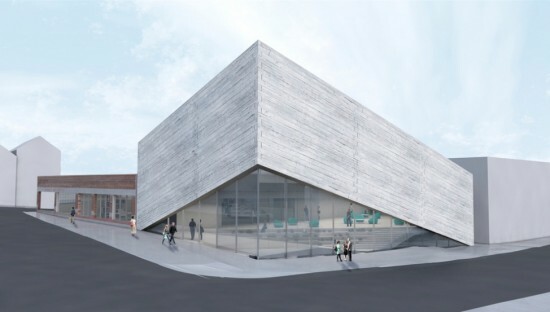 Five noted teams have been shortlisted from a pool of 18 to renovate and expand the Kimball Art Center (KAC) in Park City, Utah. The firms include BIG/Bjarke Ingels Group; Brooks + Scarpa Architects; Sparano + Mooney Architecture; Will Bruder + Parnets; and Todd Williams Billie Tsien Architects. The center offers exhibitions as well as art classes, workshops, and other educational programs. Plans call for renovating the interior of the existing KAC and constructing a new modern building next door. Each of the proposals will be displayed using augmented reality, photography, and video during the Sundance Film Festival from January 19 through the 29 and a jury will select a winner in February once the public has had a chance to weigh in on their favorites. Construction could begin as soon as mid-2013 with the new wing opening in 2015. "We want visitors to see Park City as an important emerging arts destination, and a new building of architectural importance, with an enhanced facility for the presentation of art, will do just that,” said Robin Marrouche, the Kimball's executive director, in a statement. “In addition to the positive economic effects the project could have on the region in the long term, we want to further enrich our community, allowing us to expand our exhibition and educational offerings and provide a much needed public gathering space in Old Town." 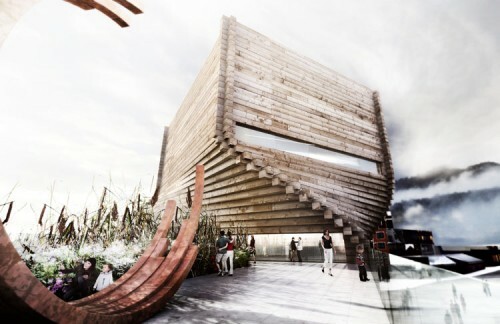 BIG's proposal calls for a twisting, stacked timber structure made from reclaimed train tracks, enclosing an interior spiral staircase and topped with an roof terrace. A sculpture garden would be included on top of the original structure. Brooks + Scarpa Architects designed a honeycomb tower called the "Kimball Cloud" that incorporates solar energy and natural ventilation. A rooftop terrace and garden is included in the new building. Sparano + Mooney Architecture also calls for timber construction, this time inspired by the Aspen tree. The new building will be covered with a photovoltaic glass screen allowing the new space to be flooded with light. Will Bruder + Partners designed a building with a colored ceramic facade that references both the adjacent masonry buildings in Park City's historic district as well as the surrounding canyons. The proposal features a rooftop terrace and a central skylight. Todd Williams Billie Tsien's proposal, dubbed a "Box of Sky and Shadow," frames mountain views and includes an exterior scrim for film projects. Check out more images of the five proposals below. Click on a thumbnail to launch the slideshow.